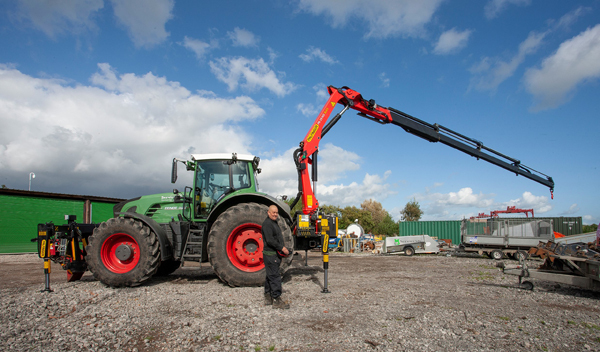 Welsh company M&D Services equipment fleet has purchased a medium duty Palfinger PK 19.001 SLD5 loader crane rear-mounted on a Fendt 936 Vario tractor. Mark Davis, owner of M&D Services, approached agricultural dealer David Evans Agri Ltd (DEAL) for a bespoke tractor with a crane, after spotting a similar customised tractor in Port Talbot built by DEAL. DEAL’s team fabricated and installed the mounting kit themselves. The bespoke fitment from DEAL goes even further by enabling the user to detach the crane and auxiliary leg stabilisers when required, so that the tractor can be used with or without the crane, or with other implements as required. The Palfinger PK 19.001 SLD5 has a four-extension C Boom with lifting capacity of up to 18.5tm and a 12.6m reach. Additionally, the front and rear additional Palfinger stabilisers offer Davis both increased stability on uneven terrain around his home patch of South Wales and extra support for heavier loads, enabling him to lift and move larger items quickly and easily.